It was an overcast day and there was a light shower overnight so the canvas on the tent was damp. We would be staying inside next couple of nights so we needed to make sure the canvas was dry. We had too move the tent into periods of sunshine to dry the tent but by 12 noon the tent was dry so we were able to pack up and headed out. Back into Mansfield we headed towards Yea on the Goulburn Highway. This took us through Bonnie Doon of “The Castle” fame. It is a summer meca for Victorians on Lake Eildon. Our final destination was Bendigo. We arrived here at 4.30pm. Bendigo has a tourist tram which was a surprise to drive across the tracks. We stopped at the Information Centre which was the old Post Office to get some advice on local attractions here. We had decided to stay in a cabin tonight so Anita could get comfortable. After checking in at the A-line Holiday Park we freshened up and headed back into town to dinner at the Foundry Bistro. After dinner we headed back to cabin and called it a night. It was a fine day with some clouds. After checking out we headed into town to do the talking tram tour. The trams run from the Golden Mine to the Chinese Joss house. The first tram was an Anzac special, a history of Anzacs from Bendigo. The tram ride lasts 1 hour. So once back at the mine we started the normal tour but hopped off at the Fountain, city centre to walk up the tower and look at Ned Kelly's armour currently on display at the Art Gallery here in Bendigo. After this we completed the tram tour and headed up back at the mine. From here we headed to the shops to stock up. After the shopping done and fridge restocked, beer and meat. I refuelled (diesel 1.29). It was a little cool by now so I put on a jacket which had been lying in the back seat on top of the tent. I felt something crawling under my arm then bam. A wasp stung me. We must have packed this bug up at Fry's Hut yesterday in the tent. The sting was similar to a bee sting and hurt for several hours. Luckily it only stung me once. Tonight we would be staying with Anita's brother Scott who lives in Caroline Springs, outer Melbourne. This would be only 2 hours travel. It was about 4pm when we drove into outer Melbourne traffic. Caroline Springs is a new outer suburb. Scott and Kellie have been here 3 years and are currently building a new house in another new outer suburb. Melbourne is a very different city to Brisbane. You can see the city centre from the outer suburbs, it is very flat. The city high rise making a distinctive silhouette on the horizon. It was great catching up with Scott and Kellie and little Emily Marie. We had a comfortable warm sleep here. Scott started work at 7am so he needed to leave at 6am. We got up to see him off. So by the time we had organised ourselves it was 9am. It was a beautiful sunny day. 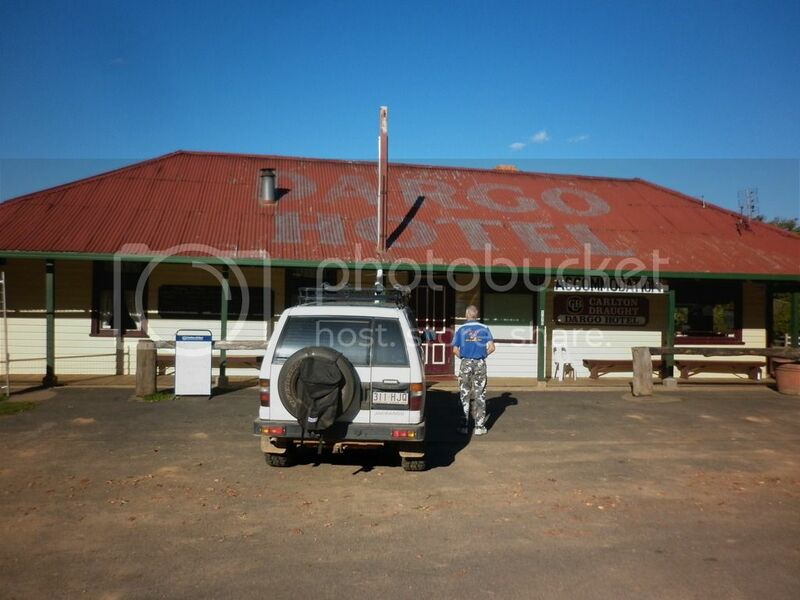 Today we wanted to head to Dargo some 4.5 hours travel. Firstly we needed to get through Melbourne. Once we were on the Western Gateway Motorway through the city centre and onto the Princess Motorway toward Sale. It was just pedal to the metal, flat wide roads. We continued on the Princess Highway through to Stratford where I refuelled (Diesel 1.30). We could have taken a back road through to Dargo but I followed the GPS another 20km north on the Princess Highway to the turn off to Dargo. It was a pleasant country drive on bitumen to Dargo. It was 3pm when we arrived at Dargo. We had a beer and did some pics at the hotel. While there Phil, the barman informed us that Blue Rag track was closed this week for tree felling. I was disappointed but not much I could do. This is one track I had wanted to do and if we had today's weather when we did it the out look would be fantastic. Phil suggested I go and have a chat to the forestry guys who have an office just down the road. Unfortunately the track was totally closed for tree felling. If the trees go through 2 bush fires without regeneration they need to be removed. We took a quick run out to the closest camp sites on the Dargo River. They were average sites but we had been spoilt so far with Fry's Hut. So back to the pub for another beer and trip replanning from here. We decided to stay here at the pub. Anita wanted to stay in a log cabin so we did. The cabins can sleep 6, cost $50 per adult. There is an en suite and very basic kitchen but it was warm and comfortable. Dargo is a pretty little town with walnut trees lining the streets. The corner shop sells a little of every thing including fuel and is the local Post Office. The pub of course being the hub of the township. We had dinner here which was a very hearty meal and turned in for the night. We awoke to a heavy fog this morning which did not lift until 8am. It was another beautiful sunny day. We cooked breakfast on the porch and packed up leaving at 10am. Continuing along Dargo High Plains Road we had bitumen until Grant Junction. The dirt roads and tracks here are very rough with a lot of rocks as base. You need to air down as soon as. We continued on Dargo High Plains Road to a small grave called Little Woman's Grave which is a memorial to all the women who lie in unmarked graves in the high country. Here we turned onto Ritchie Road and headed toward Blue Rag track. Knowing that the track was closed I still wanted to see it. We were told we could from Basalt Knob which is where we headed. Along this track there was evidence of clearance of the dead trees. Ritchie Road loops back as Basalt Knob track which took us back toward Dargo. The tracks were rocky up and down but only 2WD. We turned onto Brewery Creek Road to get out to Mad Dog Lookout. We could look back to Blue Rag and maybe get the same view across the high country mountain tops. It was a beautiful sunny day, there was internet coverage here as well. This track took us down into Old Talbotville, an old mining town now camp site. It was a great spot on Good Luck Creek. We chose a camp site, in the sun facing north. After some lunch we did a quick drive around the other sites to collect some left over firewood, we expected a cold night. Two more vehicles arrived to camp here overnight, they soon had a fire going and swags rolled out. We organised dinner and made a large fire. It was a cool damp night with starry skies, I wondered what the rich people were doing. After a few quiet ales and the wood was low it was time for bed. We bunked in for a cool night in the Victorian High Country. Temperatures overnight only dropped to 2* but it was very damp this morning. The tent was dripping wet. Thankfully our camp site had sun by 8am but it was not until 12 noon before the canvas was dry. On the road again we headed back towards Dargo on the Crooked River track. 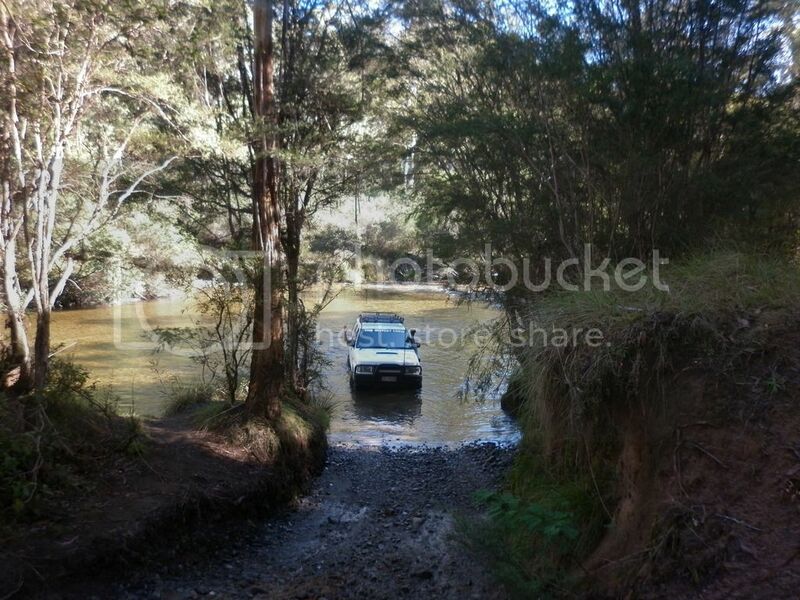 There were a few creek crossings the last being wheel deep. This crossing had been notorious for claiming vehicles because the bottom was sandy. We turned onto Randalls track which was a steep climb from the valley floor. Yes, low range second steep with a few ruts to make Anita hold tight. After the climb we were on Hibernia Road which had been recently graded. It was slippery with a loose soft muddy surface thankfully it was just a run along the spur. Once we started to climb again the surface was rocky and easy but we encountered our first tree down across the track. The tree was rotten so I was able to cut some and drag some off the track. Under way again we turned back onto Dargo High Plains road which was bitumen. Just a short drive down the road we turned onto Upper Dargo Road where the camp sites are located along the Dargo River. It is quite a rough rocky road. We turned onto Jones Road which took us deeper into the mountains. It was a graded dirt road with tight bends in places. We saw our first deer on the road. A large sambar doe ran for some time in front of us before darting off a side track. Jones Road took us to a junction called Seldom Seen Hotel or where the hotel was located. From here we turned onto Baldhead Road which would take us through to Swifts Creek on the Alpine Way. We continued to Omeo and I refuelled(alpine diesel 1.47). It was now 4.30pm, cold and overcast so we decided to stay here tonight. Our original destination was to be Benambra but there was only a hotel and general store there. So we found some accommodation here Colonial Motel just a stone throw from the Golden Age Hotel. After a quick shower and change we headed there for a meal. Both of us had fish and chips with salad, and this was the first meal on this trip that was disappointing. The fish was flake which I'm not a big fan, and was quite small but I guess we are 150kms from the coast, so I should be thankful for a warm meal. After dinner we caught up on some emails and rang home, we had just heard the news, SE Qld had been swamped. Thankfully Sarah was safe but Renee needed to wait out the flash flooding at her auntie's place. It is always good to get a warm comfortable sleep. It was cold and overcast today, thermometer said 4*. We had planned a shorter day today hoping to make Dogmans Hut. So before leaving Omeo we walked around town. It was an old gold mining town with several old brick buildings still standing. Omeo had been devastated during the Black Friday bush fires in 1939. Most of the town was burnt. The brick buildings being able to be rebuilt. From Omeo we headed to Benambra then onto Beloka Road then Mount Hope Road which leads to Tom Groggin track. The track is rutted and not well maintained in spots but an enjoyable drive. Once we arrived at Dogmans Hut we drove down to the Murray River crossing to check it. The crossing is shallow in an arc but deeper straight across. The water was freezing as I walked it only half way up my shins. We will cross tomorrow. So back to set up camp at Dogmans Hut which is on the Victorian side of the Murray River. This hut was built by the Lands Department for the dog men in 1964. Hut was a year old than me. The camp area Tom Groggin is on the NSW side of the Murray River. The area gets its name from the cattle station located here which has been derived from an aboriginal name of a water spider. So we settled in, built a fire and enjoyed the cool starry night. About 7.30pm a couple from Canberra arrived, Rich and Kylie. They were camped at Geehi Hut on the other side of the Murray. Rich was a keen hunter and wanted to show Kylie this hut. We chatted about Rich's hunting and fishing areas which includes Imbil, there are deer around Borumba Dam. He is currently working in Canberra on a construction site but gets into the high country at every opportunity. 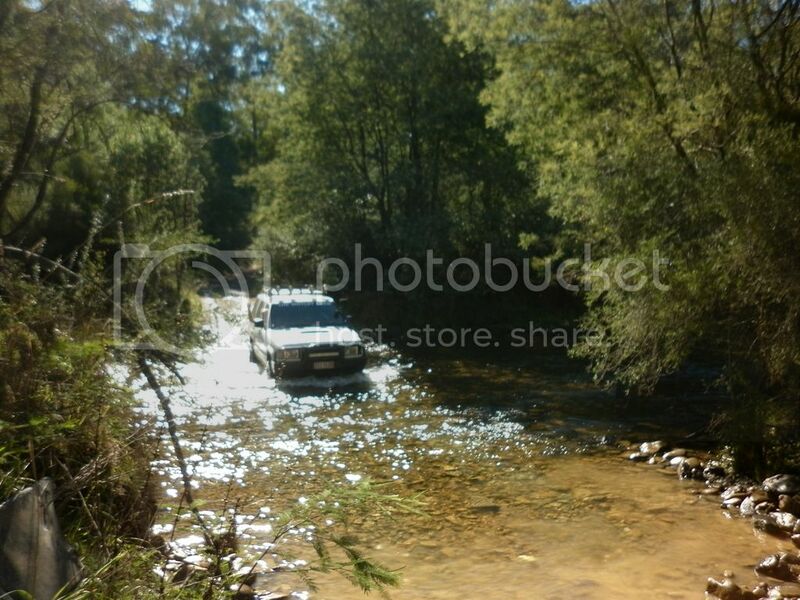 When they left I followed him out to watch him cross the river in a stock 4wd Hilux ute in the dark. He probably took a more direct line which was headlight deep but he made it look too easy. It will be my turn in the morning. It was quite foggy this morning and once again every thing was very wet. After breakfast it was chasing the sun to dry the tent and slowly pack up. This would be our last couple of hours in Victoria. By 11am we had every thing packed into the car but the tent fly was still slightly damp. We headed down to the Murray River crossing, I tied the fan, second low and away we went. Having crossed the Murray we were now in NSW. The camping area here is called Tom Groggin. It is accessed from Alpine Way. It is a great spot and I will return to camp here. On the Alpine Way we headed towards Threadbo then to Jindabyne. What a spectacular town, situated on the lake with mountains all around. There are some beautiful spots here. On the road again to Cooma, I refuelled here(diesel 1.37 ) and had we some lunch at a local cafe which was previously a Commonwealth bank. Anita wanted to do the Grand Pacific Drive which starts in Nowra so that would be our destination tonight. So from Cooma we took the more direct route to Nowra through some national parks, some of these roads are dirt. Once again being recently graded, they are quite slippery. We arrived at Nowra by 6.30pm and checked in at the Pleasant Way motel because the caravan parks were full. It was a catch up with emails and facebook night. Being a motel we were not able to cook our own breakfast so we got away by 9am and started the Grand Pacific Drive toward Shoalhaven Heads. It was overcast and by now temperatures were only mild 15* minimum. This drive would take us along the coastal villages of southern NSW to finish in Audley on the outer edge of Sydney. We stopped at Gerringong for breakfast in a cafe that overlooked the beach. It was a very pretty location. 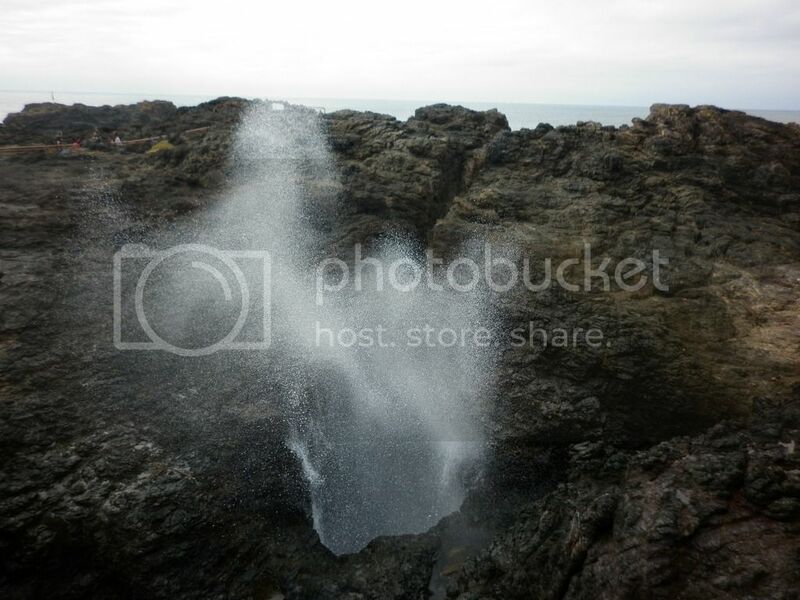 Continuing on we made Kiama which has a blowhole. It was one of the best I'd seen, currently with high tide the water spray was quite high. From Kiama you enter the Princess Highway until Shell Harbour where the drive takes the more coastal route to Wollongong. After Wollongong there is the Sea Cliff Bridge which is a 650m section of the road built out over the sea. The bridge was constructed in 2005 because the original road on the cliff was getting to costly to maintain and unsafe. It looks spectacular in the pictures we had seen and having done it, I guess it was not all that big a deal. Once we got to Bald Hill, the hand gliders and Paragliders were amazing to watch as they soared with the rising wind currents. This is where Lawrence Hargrave(who?) the bloke on the old paper $20 note, took his first flight. The look out here is well worth the stop. From here the drive enters the Royal National Park, apparently the second oldest in the world, established in 1879. The drive winds and curls through the park for 42km. The drive is through thick jungle vegetation which looks to have taken a hammering from the wild weather Sydney experienced last week. The drive finishes back on the Princess Highway at Audley so I needed to set the GPS to find the address for tonight. I refuelled here (diesel 1.32). Anita had booked a small flat through Airbnb, a website where people can advertise rooms for letting privately. We got our Tasmanian unit in Hobart through the website in September, it was a good experience. The unit was located in Lawson which is 20 minutes east of Katoomba. We drove through Lawson at 2pm so decided to drive onto Wentworth Falls. This was a planned attraction we wanted to see. The falls are one of the main attractions in the Blue Mountains. Once again NSW Parks have done a magnificent job with infrastructure at these spots. There is a large picnic area here but I will say the car park spaces are quite narrow. From the car park there is a look out over the Jamison Valley. A short walk to the falls lookout gives the best view of the falls as Jamison Creek cascades over the escarpment in two sections. From here there are numerous walks. We headed down the Over-cliff track, it was well formed but still quite wet and soggy. This takes you the top of the falls. From here we headed down again to the Under-cliff track which is just that. The track meanders along the cliff with sections overhanging the track. The vegetation is quite topical with ferns and tree ferns. It was still quite wet with a lot of seepage in this section. After doing some of the walks here we headed into Katoomba to view the Three Sisters. The attraction is viewed from Echo Point which is basically at the end of town. You need to pay for parking here and walk 5 minutes to the viewing platform. There are bus loads of tourists but to see one of Australia's most iconic natural attraction was worth it. After some shopping in Katoomba, which is quite hilly, we headed back to Lawson and found our flat. We walked to the local pub called Blue Mountains Hotel for dinner, it was another busy day with lots of sight seeing. It was quite foggy tonight as we walked home. We had a comfortable sleep overnight. Today we had planned to spend at Scenic World in Katoomba. 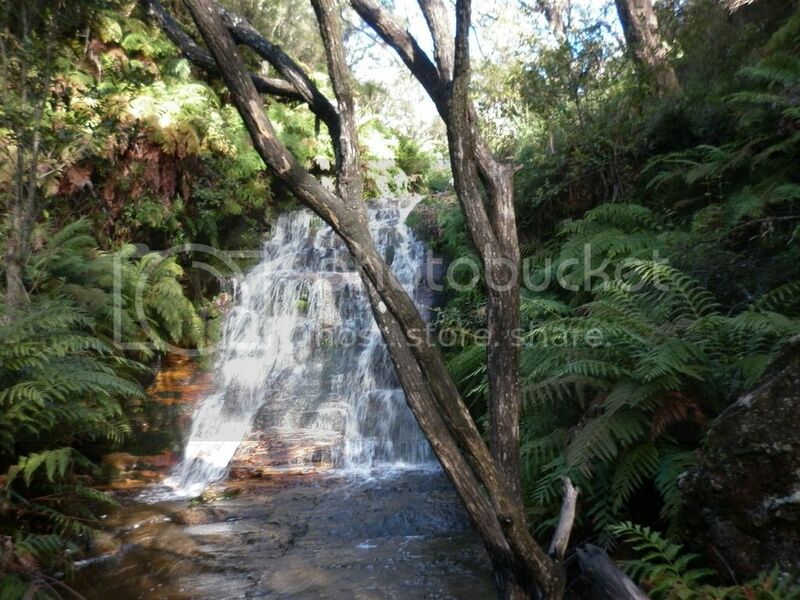 Scenic World is a tourist attraction here with 3 separate rides to experience the Blue Mountains and Katoomba Falls. There is the steepest railway in the world here which was the first attraction built here. The original railway was used to haul coal from a mine on the side of the cliff up to Katoomba in 1836. It technically is not a railway train but a cable car which runs on tracks but the slope is 52* which is steep. It was a beautiful sunny day but windy. So we headed to Scenic World. We paid for the unlimited day pass which was $35 each. The wind made the Sky Way more exciting because of the slight sway with the wind. This cable car gives the best view of Katoomba Falls and with the glass bottom you get a good look at the tree canopy below in Jamison Valley. We rode the Scenic Railway down and up, it is steep and I would liken it to a roller coaster. For the record Anita closed her eyes going down. There is a board walk on the valley floor which you can walk down to or take the Cable Way, guess which we took. We spent most of the day here walking the board walks. There is currently a sculpture display set up around the board walks which we were not interested in but walked through anyway however the highlight for me was seeing a lyre bird scratching around in the leaf litter not worried by us at all. It was wonderful to see. On our way home we stopped at another look out which gave us a look at the back of the Three Sisters call Sub-lime Point, it was not that spectacular. Once we got home Anita caught up on some washing and I tried planning our route home. We walked to the pub for another meal and few beers. We started the day early because we needed to get to Jenolan Caves a 1.5 hour away. It was a beautiful sunny day again with some wind. 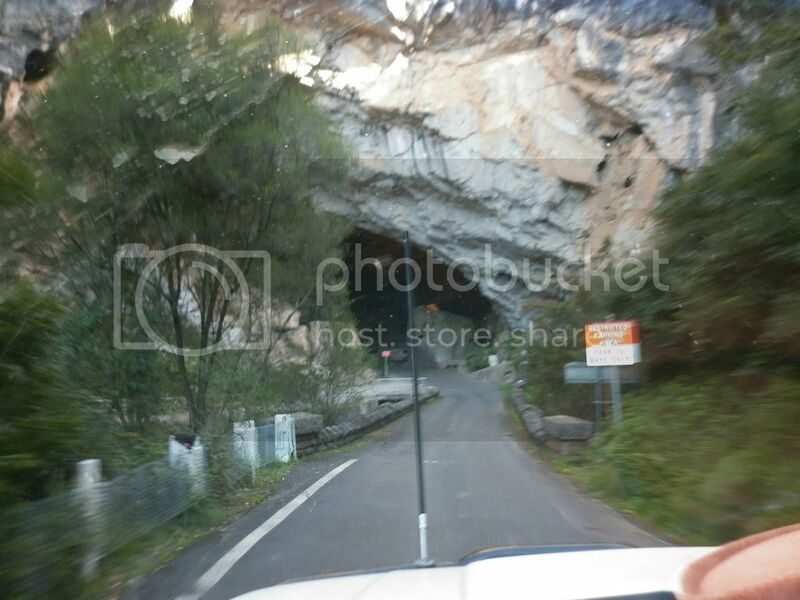 Some we set sail west to Jenolan Caves. The road into the caves is very narrow and steep. It is only one way in between 11am and 1pm for the tour buses. The road winds through the Grand Arch to the visitor's centre and hotel complex. We arrived at 9.30am so the first cave tour we could do was the Imperial Diamond Tour at 10.30. This costed $32 each and lasted 1.5 hrs. The tour guide Barry had been working here for 44 years, he was very informative. The caves are quite massive but there are sections where you need to bend down. The caves are well lit and have been since 1880. After the guided tour, we did the self guided tour through the Nettle Cave which is an open cave so called because of the stinging nettles here. The tour lasts 1 hour and tells of the caves history. There are several stairs through the cave. White man has been visiting the caves since 1830's. By 1pm we were on the road again hoping to make Mudgee tonight. There was just one more stop Bathurst. I guess most Aussie petrol head males would know Bathurst and try and make the pilgrimage at some stage. 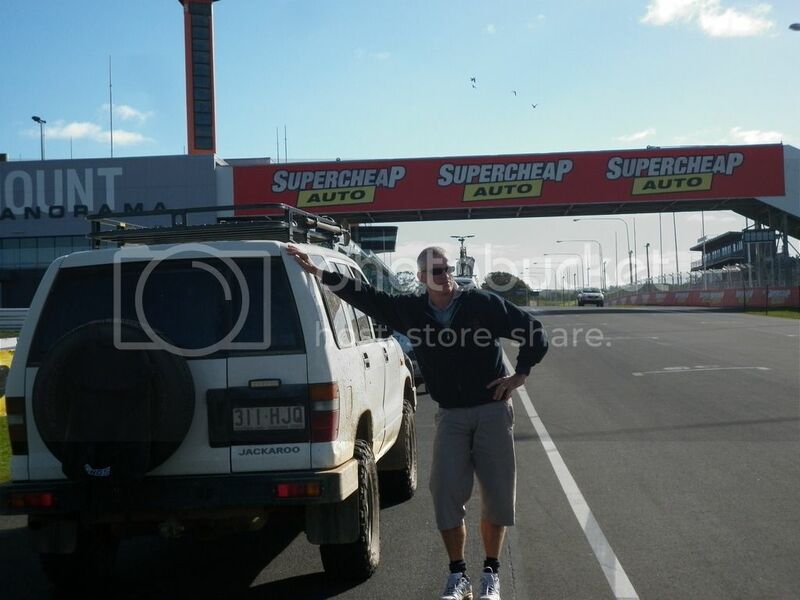 So we headed for Mount Panorama and drove the track in less than record time but enjoyed every moment. The road is speed limited to 60km/hr. From here it was just a drive up the road to Mudgee. We checked in at the Riverside Tourist Park and refuelled (diesel 1.34). Mudgee like so many townships developed with the gold rushes in the 1800's. The Red Heifer Bistro, hotel where we ate had plenty of memorabilia on the walls from this era. Another sunny but cool day. Today was just travelling chasing the sun north. After loading the Jack we headed north to Gulgong. We wanted to make Glen Innes today and head home via the New England Highway. So we headed for Coolah to Mullaley and onto Tamworth which put us on the New England Highway. We stopped at Tamworth to stretch our legs. Once under way again we stopped at Uralla to refuel (diesel 1.37) from here it was a just drive to Glen Innes where we arrived at 4pm. We checked in at Popular Caravan Park for our last night on the road. We walked into town for a feed which I must say was the best I had while being away. A beautiful sunny morning but cool. After breakfast, packed the Jack we were on the road by 9am. Anita wanted to pick up some produce, eggs, potatoes & strawberries before we left which we did. The eggs were only $3.20 per dozen and fresh that morning. We had reached Tenterfield by 12 noon and while driving down the Main St passed another Motley, Peter and Esther who now have a property down this way. It was a friendly wave but we kept going. I wanted to stop in a Bald Rock National Park to check out the camp ground. It has a vehicle entry fee $7/day and camp fees $10 per adult per day. There are fire pits with fire wood provided, pit toilets and tap water in the camp ground. 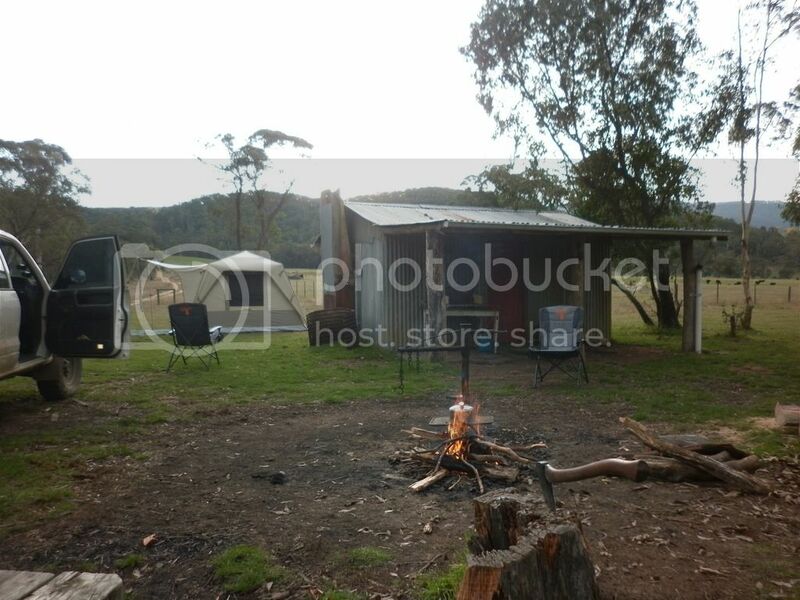 The camp sites are compressed granite areas similar to Girraween, I'll be back. Through Stanthorpe and Warwick refuelled here (diesel 1.28) onto Capalaba to collect Anita's car. I arrived home at Redcliffe by 3pm to find Sarah in a flurry cleaning the house before mummy arrived home. So the unpacking began and the adventure had come to a finish. Here are some final figures and thoughts. My highlight was crossing the Murray River at Tom Groggin. I'm thankful that Anita braved the cold and closed her eyes when we drove the slopes. In future I would take a chainsaw and tour between the camp sites. There are many beautiful spots. Next time you're in the Blue Mountains, go visit the Three sisters after 5.00 p.m...we went there many years ago and left quickly due to all the tour buses and crowds there. Later that afternoon we grabbed some fish and chips for dinner from a local shop, and went it ate it at the lookout with only a couple of other people about the place...it was a much nicer place to be at that time of day then earlier was. Maybe when you plan to head to Bald Rock make it a Motley trip mate, i climbed the rock with Makensie in a back pack many moons ago, the views from the top are stunning...same goes for The Pyramid at Girraween National Park also. Thanks Mal, I have been enjoying your adventures. Yes, I have 700 pics from the trip. Bald Rock can do as Motley trip, like you suggested maybe drop in on Peter + Esther as well.